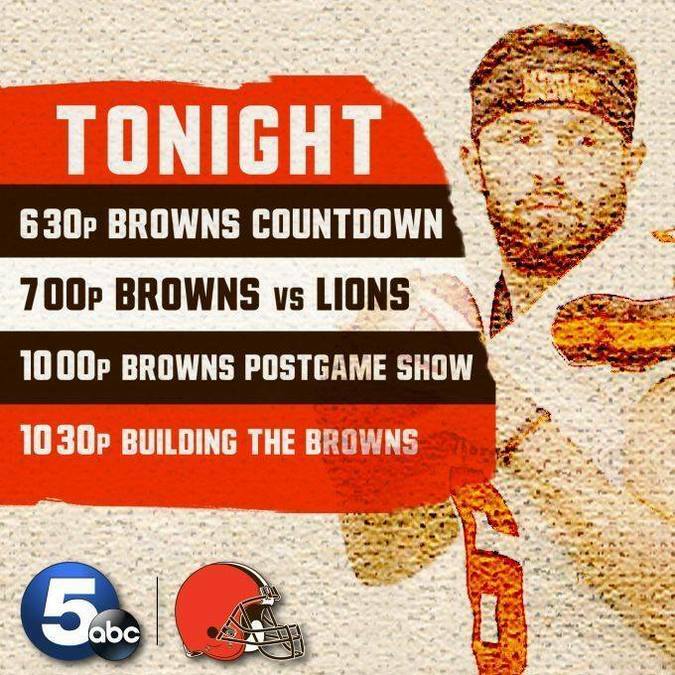 The Browns take the field opposite the Detroit Lions for the final pre-season game of the year at Ford Field in Detroit at 7 p.m.
Watch the game on News 5 Cleveland – channel 5 on most cable and satellite systems, and over-the-air with a digital antenna. Pre-game coverage begins at 6:30 p.m. with Browns Countdown, all of the latest news and reports surrounding the Cleveland Browns are explored, including profiles of the top players on the squad. See a full schedule of News 5 Cleveland programming here. Bringing you the game tonight only on News 5 are Jay Crawford, Tim Couch, Bernie Kosar and Dustin Fox. Watch online on Browns.com and on the Browns App. Note that geo-restrictions apply. Browns.com streaming limited to Cleveland, Akron, Youngstown, Dayton, Toledo and Columbus. Watch on cable and streaming on the NFL Network. Click here for more information. Drive to Detroit and watch the game at Ford Field. Tickets start at $9 . It will take about two hours and 40 minutes to drive from Cleveland to Ford Field , so if you leave by 4:20 p.m. Thursday, you may catch the kick-off. But it's probably just easier to watch it on News 5!